Ireland has three species of native amphibian: Common Frog, Smooth Newt and Natterjack Toad. The Common Frog and Smooth Newt are found widespread throughout Ireland. However, the Natterjack Toad is restricted to only some parts of Kerry and Wexford. We are focusing on frogs and newts here as we looked at the Kingdom Toad (aka the Natterjack) last year! 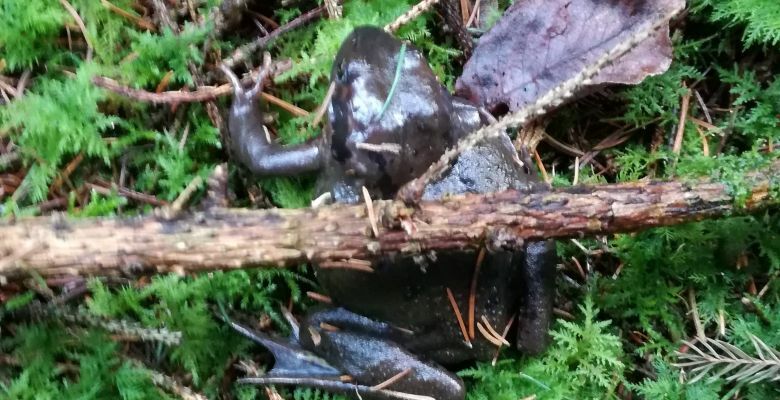 At this time of year you may come across frogs and newts as they move out of hibernation and refuges (under dead leaves, dead wood, little burrows). They will make the trip (up to half a mile recorded!) through the cover of rough grasslands and along hedgerows to their breeding ponds. As amphibians, frogs and newts spend most of their life cycle on land only travelling to ponds / still water to breed. Both species of amphibian tend to be faithful to the pond from which they originated, which is why it is important to keep ponds. However, with wetland areas disappearing it is important that such breeding areas are included in design plans. 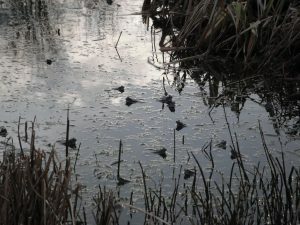 Frogs spawn in ponds from January to March, depending on the weather. Frog spawn is easily recognisable as clumps of jelly like substance with black embryos encased (different to toads which lay eggs in a string formation). Smooth Newts lay much smaller eggs. 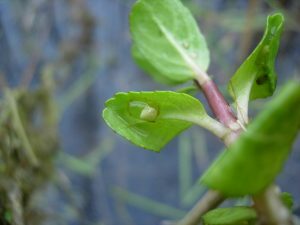 They lay single eggs folded in to vegetation. Smooth Newts tend to wait to breed until the weather is a bit warmer, typically in early Spring. If you are conducting work which you think may harm a breeding pond or would like more information on how to enhance your site for these species, please get in touch with us. Any sightings of newts or frogs should be reported to the National Biodiversity Data Center (NBDC). The NBDC holds a database of all species (plant and animal) and is a useful resource to get an insight to the distribution of species throughout the country.